I never thought grapes would grow as well especailly up here in Northwest Wisconsin. 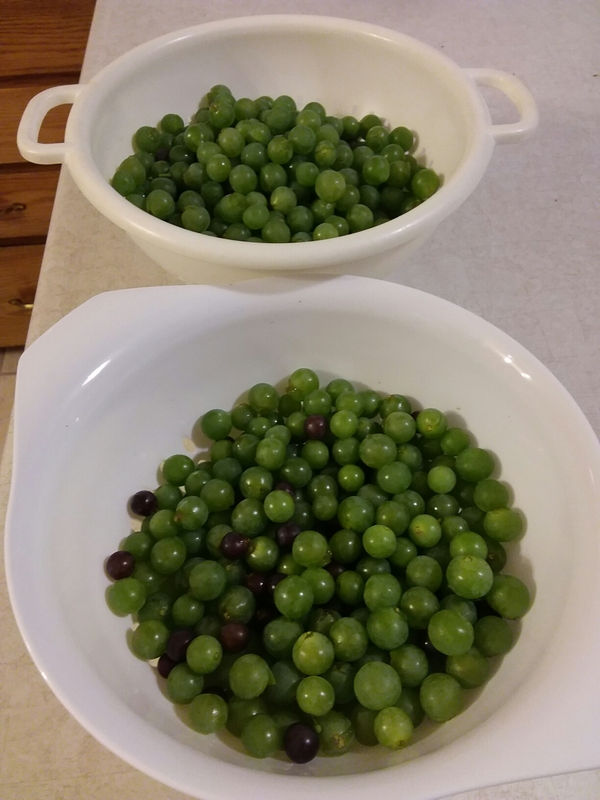 Last year we had very few and tiny grapes. Because I haven’t been able to get out to the vegetable garden(the garden is 20ft away from the house), as I wanted to this year due to walking difficulties. I gave up on watching the vines spread and grow and even vining on to some of my other heirloom plants out side of the veggie garden. As I watered my deck vegetables, I noticed flock of blackbirds in the garden and I limped down and noticed what they were after..Grapes, I have never seen so many(I take that back,Only in movies and documentaries). I had a total of five bowls. In which I had picked throughout the weekend and it was fun learning how to make sweet grape juice and learning how to can. I have not mentioned I had a lone zucchini plant in that garden also, which I harvested nine zucchini’s and then surprise I have two tomato plants also. I feel good and blessed with my plants, But grapes in Northwest Wisconsin? Happy am I..
NIce! Those look delicious! I cut my grape vines down a few years ago, they were so old! I know how much work they are so kudos to you! What did the grapes taste like? Sweet or sour? Thank you for asking, I just went back in and wrote that I made Sweet grape juice, because the grapes were sweet. It sounds like your garden is doing well. I’m happy for you. Fresh produce.